We are nearing the end of the social media #IAMLICENSED series. I hope you have enjoyed it and that it has elevated awareness for your community. For this next to last post, here is an excerpt from Doug Schoon’s upcoming book Face-to-Face Volume 2. 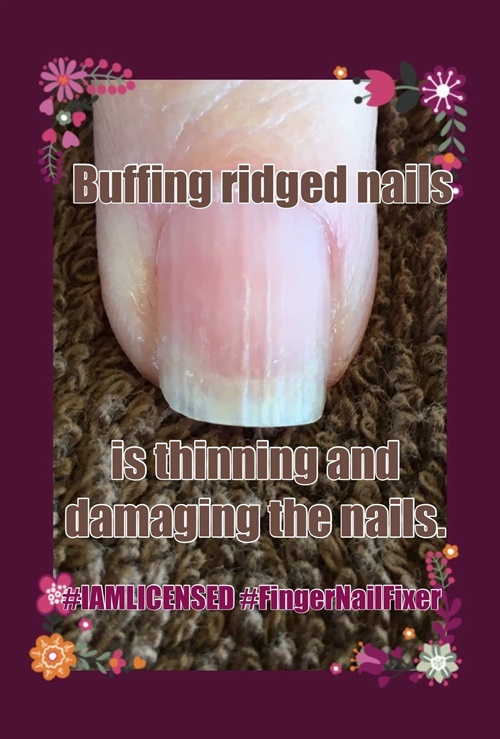 “It is common for nail technicians to buff the nail plate smooth to remove so-called “ridges,” but surprisingly, there are no ridges on the nail plate to be removed. The nail plate can’t suddenly start growing ridges. That’s not possible due to the way the nail matrix produces nail cells. Instead, the nail plate develops shallow grooves where the aging or damaged nail matrix isn’t working as efficiently and is now making fewer new nail cells in certain areas. It is normal to see shallow grooves on nail plates of people older than thirty and is considered a normal sign of healthy aging. I don’t recommend filing to remove these high points. Why? That just reduces the thickness of the entire nail plate and the nail plate can be sustainably weakened. Buffing away these so-called “ridges” will just thin the nail plate down to be as thick as the bottom of the deepest groove on the plate. The file just strips away the top layer. Yikes! That’s a lot of nail plate being removed. It is far better to keep the client’s nail plates thick! Nail coatings, including nail polish, don’t adhere well to overly thin nail plates. This is a practice many of us are familiar with. If you didn’t know any better before now, then this is a great opportunity for change and education. Explain that you have learned something new in your quest to care for your guests’ natural nails to the best of your ability at all times. Change is a sign of that learning and will help the salon client know what to avoid in the future should you become unavailable. Ridges on the nails are actually not ridges, instead they are rows of missing nail cells where the matrix has either aged or been damaged and can no longer produce them. Natural nails should NEVER be buffed smooth in the presence of these grooves as it will thin them down and make them more likely to split or break.